Several years ago I started making a Cheesy Potato Casserole to bring to church breakfasts and brunches. It is always a huge hit and people always ask for the recipe. We never have any leftovers to take home (much to my husband’s dismay). The last time we had a breakfast, I brought only one Cheesy Potato Casserole. Farid was so disappointed that there was none left by the time he went through the line. So this Sunday when we had an Easter breakfast, I made two…and they were both demolished! What’s so special about a Cheesy Potato Casserole? 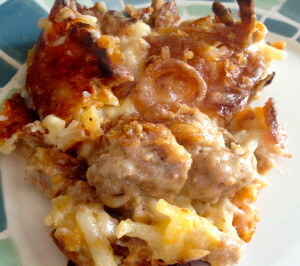 Two ingredients: ground breakfast sausage and french fried onions! The french fried onions give the dish a flavor that corn flakes or bread crumbs could never give and the sausage is just a bonus. Try it! It just may be your most asked for recipe!! 1. In a skillet, brown ground bulk pork sausage. 2. In a large bowl, combine hashbrowns, cream of chicken soup, sour cream and cheddar cheese. Add sausage. Mix well. 3. Grease a 9×13 baking dish. Spread potato mixture into dish. 4. Melt butter. In a small bowl, combine melted butter and french fried onions. Mix well. Sprinkle on top of potato mixture.